An elegant and homey style of kitchen sink is the farmhouse, or apron sink. This is the style that has a broad apron at the front of the basin. Because of this, you’re able to stand directly in front of the sink with no hindrance from kitchen cabinets. 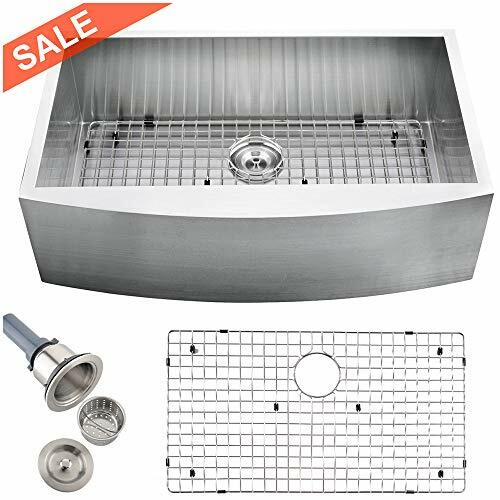 Let’s take a look at some of the best stainless steel farmhouse sink available on the market. First up, the Kohler K-5827-0, is a beautiful example of this modern amenity. With a self-trimming overlap that covers kitchen cabinets, this one looks smooth and elegant. But, keep in mind you need a minimum space for clearance of 33” for this sink. Because this type of sink most often has no faucet holes, you’ll have to set the faucet behind or to the side of the sink. That said, not having any openings in the sink itself creates a polished look. Although it’s not the deepest sink at 9”, that’s also one of its advantages. Instead of having to reach way down to retrieve utensils, their closer to the surface. First, that’s better for your back. Second, it looks slimmer when installed. Thanks to the 2” slope design, water will never pool near the drain. A high-shine drain stopper finishes off this classy model. If you’re looking for a tasteful and simple porcelain look in your kitchen, this is a great option. 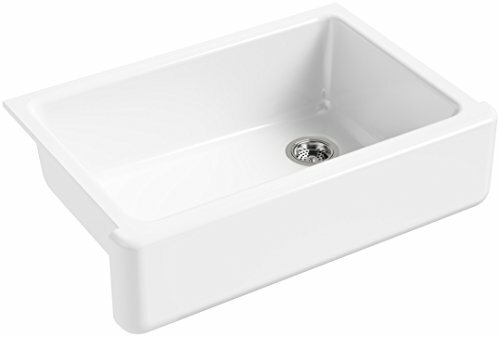 Featuring a 60/40 split, double basin design, the Kraus KHF203-33 offers an industrial look. 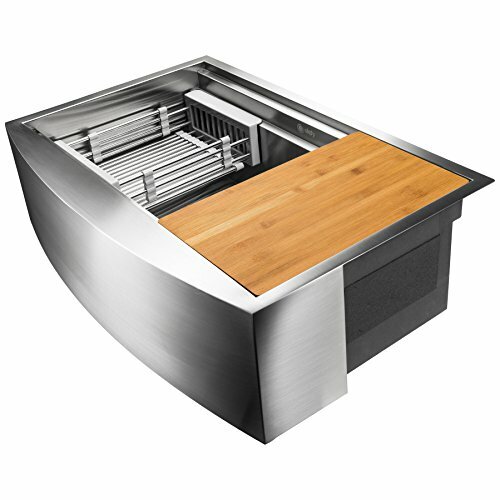 Perfect for more modern kitchens, the Kraus gives a professional quality. In this case, a durable steel provides one of the more robust models we’ve reviewed. Because of this, this sink might prove too bulky for some kitchens. Still, it offers a strong and finished look in the right application. With the drains set in the rear of the basin, more room is allowed for washing dishes. And, since this is a stainless-steel design, padding and sound absorption cancels the volume of impact well. Thanks to the curved groves at the base of the walls, water drains easily. And, because of the super-thick, T-304 premium grade steel, this thing is a tank. It will definitely stand the test of time and look good doing it. Although a split design always makes it more difficult to wash larger dishes, it does allow you to organize things better. With the deep basins of these style sinks, the split design is easier to justify. The perfecto PKB-KS0063 offers a large rounded apron front. This really maintains the old-school look of the farmhouse sink. But, because it’s stainless-steel, it also offers a modern look. This one is really a professional grade model. And, in fact, it has an industrial style vibe when installed. This might not be for everyone but finishes modern kitchens nicely. Because the drain is situated in the back, drainage is always smooth. This is a big plus when dealing with these larger model sinks. If water is standing, it can easily ruin the whole experience. No sink holes are predrilled here, so this is another example of where you’ll have to get creative with the faucet placement. That said, because the faucet is removed from the design, it offers you the most room possible within the basin. The brushed style of the stainless-steel gives an even more modern look, and even a touch of elegance. For contemporary kitchens, especially with stainless-steel appliances, the Perfecto PKB-KS0063 is a strong choice. The Ruvati RVL2100WH provides a nice ornamented design. This sink offers a softer approach and is a nice addition to light colored kitchens. One of the unique features of the RVL2100WH, is the reversable build. On one side, you get a smooth look. On the other side, a fluted pattern that adds a touch of grace. One of the concerns when installing clay sinks is their heat resistance. This one will hold up to some very high temperatures. In fact, you’d be hard pressed to find temperatures high enough to cause any damage. Still, fired clay designs are never as robust as stainless-steel. Keep that in mind, as a small sacrifice if you go with this style sink. Don’t get us wrong, this sink can take a beating. Its almost impossible to chip or crack. But, because of the nature of the material, is not quite as strong as other models. The elegance and glossy look to this sink is worth the slight downgraded strength. Most people don’t throw dishes into the sink from across the room. So, anything short of that and you should be safe. Another nice stainless-steel model is the MOWA HAD33DE. This one offers a more squared approach. Because of the 50/50 split basin design, you’ll have more options for washing. With super strong T-304 graded steel, this sink is one of the stronger examples. It will look modern when installed, so if that’s the look you’re going for, this might be the one for you. Also, a 16-gauge body wraps the whole design. This adds to the strength and durability of this sink. Near 90 angle corners make the MOWA slightly harder to clean. But the payoff is the ultra-modern look. With a series of channel groves in the floor of the basin, water will never stand. Also, because the drains are situated in the back, you’ll have plenty of room. We think, for the right application, the MOWA offers a great sleek and contemporary design that will bring your kitchen into the next century. Although these style sinks can look good with an old style kitchen, it will really look best in a modern and contemporary kitchen. The VCCUCINE JZXVC010SJZXS, is an industrial grenade stainless-steel model. 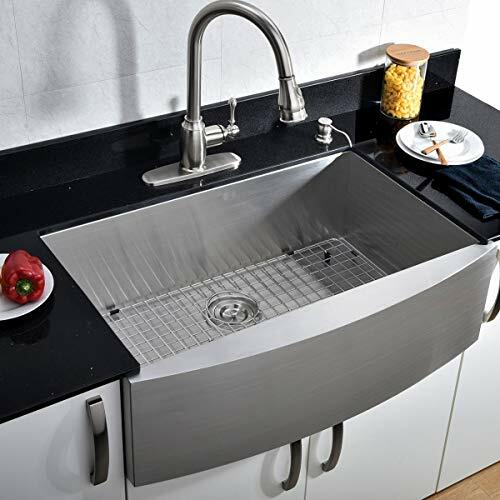 With a curved and broad front, this apron style sink has a bold look. Additionally, the depth is a good inch more than many other models. That provides a restaurant style convenience when washing dishes. Featuring the most integrated look we’ve seen when installed against cabinets, the JZXVC010SJZXS adds class. Also, with the standard T-304 grade stainless-steel, this sink will also stand the test of time. With a finely brushed finish to the steel, this one blends nicely if you have the same style appliances. And, as far as installation, this is probably the easiest one we’ve seen to install. If the space is cut correctly, this sink basically just falls into place. With its under-style installation, the countertops overlap the top rim of this model. That adds an elegant look that other models lack. It also makes cleaning debris from the counters into the sink a breeze. Just brush crumbs to the edge of the sink and drop them in. You’ll never have to be worried about particles falling through. We chose the Color y Tradicion KCS-04, mostly because it’s so different. With a unique copper design and 60/40 split double basin, this one has class. That said, you will want to consider the environment this sink will be going into carefully. Because of its bold look, you want to make sure it will fit well with the rest of your kitchen design. 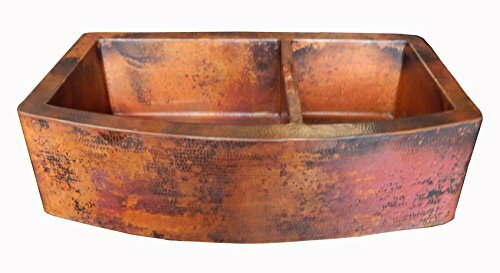 17 gauge copper creates a strong metallic surface. And, because each of these sinks are handmade in Mexico, no two will ever look alike. That’s a cool feature and ensures that your kitchen will be the only one like it in the world. The split basin is a convenient and elegant feature. Although it does inhibit using the full floor of the sink at any given time, it adds a nice convenience when separating work. Because the spilt is uneven, you can determine which side of the sink takes priority. For a modern, but unique look to your kitchen, this model offers an artistically stylized approach. 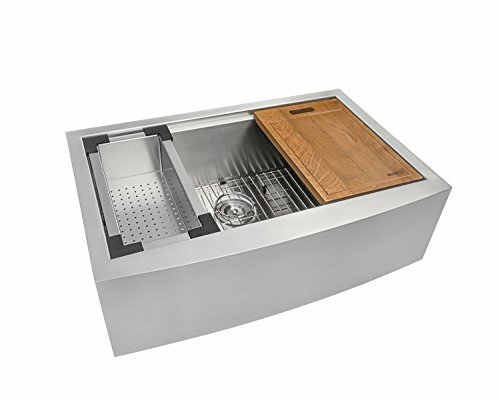 The Ruvati RVH9200 offers another nice example of a deep basin design. This one is simple and elegant, and provides a finished look with the overlapping countertop configuration. A broad, apron style front provides that nice farmhouse look while still keeping things modern. This one fits nicely with stainless steel appliances but is simple enough that it could be applied to various style kitchens. But, the most unique feature of this model, is the built-in sliding groove within the top edge of the basin. With the included cutting board and drying rack, both accessories can be slid back and forth. This adds a convenience that Ruvati has implemented others don’t have. When the accessories are not being used, they can easily be removed from their track. 16 gauge, T-304 stainless-steel provides a strong surface and body. And, that also makes this model resistance to scratches and dints. In fact, in our tests, we found that you’d probably have to take a hammer to this one in order to cause any real damage. A little on the expensive side, this model is worth it, for those wanting modern conveniences and the beauty of a farmhouse style apron sink. 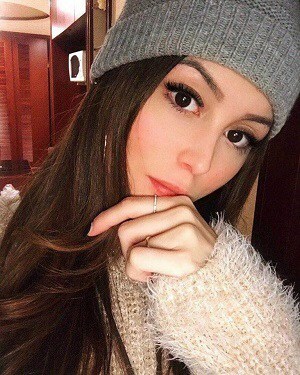 Close on the coat heels of the Ruvati is the beautiful and elegant AKDY AKA7352CF. This version also features the track sliding cutting board and drying rack. In fact, in some ways, this one looks even more finished and integrated than the Ruvati. They have different looks, so it’s really a personal preference. A single drain toward the middle of the basin offers good drainage. And, the walls are slightly curved which makes cleaning a cinch. 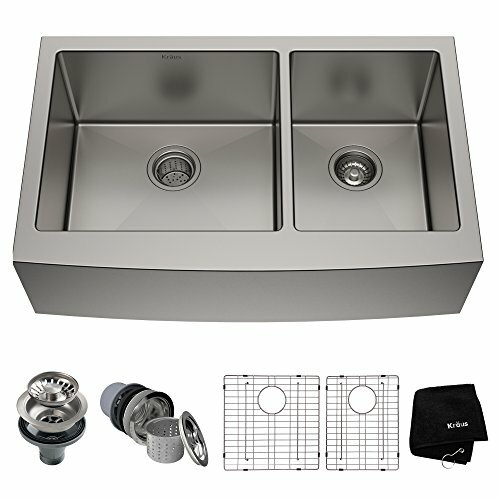 With SS-304 gauge stainless steel, this model is actually a little stronger than the other sinks we reviewed. And, for a more affordable price, you can’t beat this strength. This one tends to be very quiet as well. We got the chance to test throwing some pots and pans in this one. The sound stopped almost immediately. That’s pretty impressive. For those looking for a highly robust and industrial style farmhouse style sink, this a great choice. Less expensive than some of its high flatulent competitors, you might be getting slightly better features here. The VCCUCINE JZXVC011SJZXS offers a similar farmhouse style apron design to some of the others. However, the unique feature of this sink is how wide the apron is. This one has a bold look and gives off a strong industrial vibe. That said, it keeps its class and finishes modern kitchens nicely. With the standard T3-4 grade stainless steel, you’re assured against dints and scratches. And, with an elegant brushed look, slightly smoother than other models, you’ll create an expensive and high-class look in your kitchen. With a 10” deep basin, you’ll have plenty of room to work. A convenient straining grid is included to line the bottom of the sink. It prevents pots and pans from scratching against the surface, and also keeps things clean. Although the counter tops do overlap this model, the overlap is more slight than on some other models. That gives a flushed and finished look to the sink when installed. Combine that with the fast moving groves for drainage and great sound absorption, and you have a winner. We’ve taken a look at some of the farmhouse sinks available on the market. This a classic and elegant style that completes kitchens nicely. If you’re shopping for one of these style sinks, make sure you have enough room in your cabinet space. These sinks tend to take up more room than a standard sink. 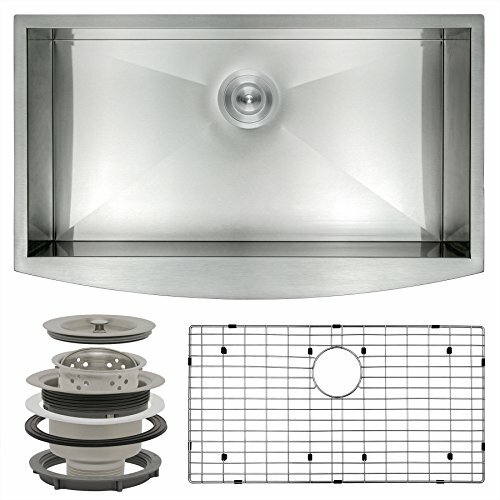 Our top choice from the sinks we reviewed are the KOHLER K-5827-0 and the VCCUCINE JZXVC011SJZXS. We feel each of these most represent this classic style. Be prepared to spend a little bit of money on these. However, for the classy approach they provide for a kitchen, we feel it’s worth the cost. The most important thing to keep in mind when shopping for this style is measurements. Because they require a more customized fitting, you want a professional to install this. If you’re doing things yourself, the one advantage you will have, is the ability to fudge the cutting slightly. Because most of these sinks offer counter overlap, you can afford to keep things a little jagged around the corners. That said, you’ll want to make sure the faucet is placed perfectly because this cannot be easily adjusted later. Also, make sure the hardware you choose matches the sink well. Because this style sink usually does not have a faucet hole, that part of the mechanism will be installed separately. You can usually find good matching components, however, make sure to do a side by side comparison before installation. 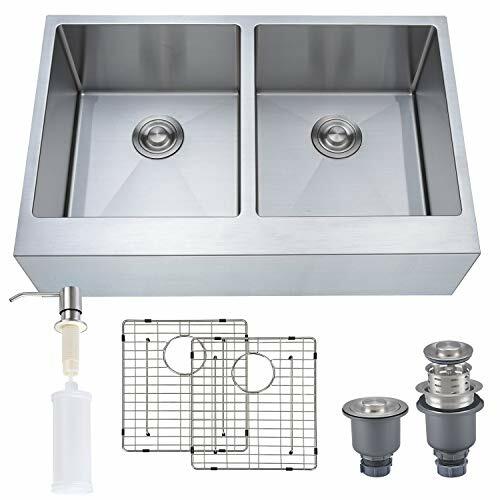 We think this style sink will make for a great new look to your kitchen. With the little bit of work and money you’ll invest, you’ll have a unique design. 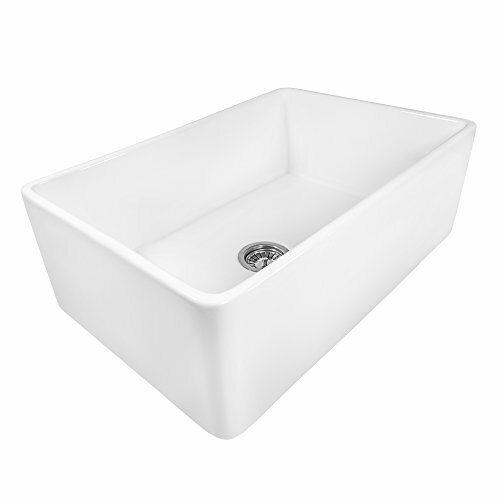 Slightly more interesting than the standard style sink, the farmhouse sink will add class and modernity to your house. Customizing your kitchen with a great farmhouse sink can bring an old school look but modern feel to your kitchen. With extra room for washing and excellent drainage, these sinks excel in both form and function. Good luck with your purchase and enjoy your newly upgraded kitchen.